2015 Composers + Musicians Collaborative Residency: Program Brief | I-Park Foundation, Inc.
I-Park will be hosting an experimental, onsite Composers + Musicians Collaborative Session from August 16 to 24, 2015 – as part of its 2015 artists-in-residence program. You are invited to submit samples of your music/sound art for consideration by I-Park’s partner and curator for this program, ensemble mise-en. The goal is to enrich the traditional creative process involved in bringing a music project from concept to concert. The program will pull together a group of composers, a performing ensemble and its music director in an intimate, immersive residency setting. The program will encourage collaborative exchanges of ideas and inspiration, entail numerous readings of the new works in progress – and culminate in a series of 3 concerts. This residency is viewed as a possible precursor to I-Park’s future Contemporary Composers Institute (CCI). I-Park will invite 6 composers to join music director Moon Young Ha and 6 musicians from ensemble mise-en. The orchestration will consist of: flute, clarinet, trombone, piano, violin and contrabass. Invited composers will be asked to write, and if possible, submit before the residency, a semi-complete composition written specifically for this orchestration. The work will be brought to completion in collaboration with the ensemble during the residency. The 6 new pieces will be premiered at a concert in the sanctuary of St. Stephen’s Episcopal Church in East Haddam and again, soon thereafter, at an appropriate venue in New York City (to be announced). Additionally, each participating composer will be paired with an ensemble member to collaborate on a totally separate piece for solo instrument. These works will be created from scratch during the residency – through the one-on-one interaction of the composer and musician – but also in the context of the inspiring natural and built environments existing at I-Park. This aspect of the residency will result in 6 new site-responsive works that will, conditions permitting, be premiered in the I-Park landscape by the ensemble mise-en musicians after the concert at St. Stephen’s. Participants will be provided with lodging, studio/rehearsal space, a meal program and staff support during the residency. While participants will bear no costs for the program, they must provide for their own transportation to and from the facility. Important: There have been some questions regarding the required work samples for the program application. You are not expected to submit an existing ensemble piece that has the same instrumentation as the group of performers who will be on-site during the August residency. There are no restrictions whatsoever on the orchestration you may submit in your previous ensemble work sample. Also, be advised that the application processing system being used for this program does not automatically save your text when you are working in the form. You should create text files on your own device and paste them into the form where indicated as opposed to keying directly into the form. That way, if there’s a problem with the internet or your browser, you won’t risk losing your work. If you have any questions about this program or the application process, please contact ensemble-mise-en manager Cheryl Krugel-Lee (manager@mise-en.org). ensemble mise-en is an innovative and versatile New York-based contemporary music collective led by composer Moon Young HA. With over fifteen of New York’s most talented musicians, our multi-national personnel strive to bring a repertoire of challenging, new sounds to diverse audiences. We wish to impart an experience that is simultaneously multi-cultural, intellectually stimulating, and aesthetically pleasing ("mee" in Korean means "beauty", "zahn" means "to decorate"). The ensemble promotes large-scale composition projects and dynamic performances of contemporary music featuring the works of established and budding composers. 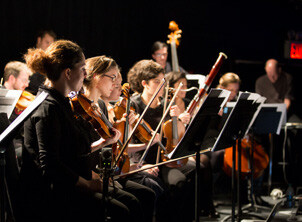 Since founded in 2011, ensemble mise-en has collaborated with many esteemed partners such as Washington Square Contemporary Music Society, International Alliance for Women in Music, Austrian Cultural Forum New York, Open Meadows Foundation, New York University, New York Foundation for the Arts, Goethe-Institute (Boston), Villa Gillet (Lyon, France), and more. As of date, the ensemble has presented a total of 115 pieces, of which 40 being original works written for the group, and 41 US and NY premieres. The ensemble has performed at avariety of exciting venues such as (le) poisson rouge, Bohemian National Hall, the Tank, the DiMenna Center, Tenri Cultural Institute, The Invisible Dog Art Center, and the cell. It is our mission to create a concert experience that allows us to engage with our audiences through educational workshops and interactive presentations, providing the public with meaningful connections to the incredibly vast, diverse and growing body of contemporary compositions. Our season series and summer festival supports interaction between audiences of all musical backgrounds and abilities, and also has programs for young and less-experienced composers. We take great pride in curating programs that allow for diverse multi-cultural exchange within New York City’s new music scene.